The April Blog should be filled with images from camp, but unfortunately I waited too long and lost the opportunity for sunny, bright pictures. During the first week of April, I will be sure to take pictures that will give you an idea of the changes that are transforming camp from bleak and stark to full of new life. Stay tuned! There is finally a buzz of activity here. The snow is gone and the lake is free of ice. The winter seemed to hold on a bit too long, but I believe we are now on the path to warmer times. We are at the time of year that will bring camp back to its recognizable, summer-like look. Many tasks are underway. One of the major jobs at Asto Wamah each spring is turning on the water. Our water pipes are on the ground’s surface so they need to be drained each fall to avoid having them freeze and break during the winter. This is an exciting time for camp! We are ordering new fun activities and equipment as well as upgrading programming supplies. The A-Field has weathered the snow and heavy rainstorms and is now green, level, and waiting for the FUN. We are filled with anticipation for the new camping season on the horizon. Asto Wamah’s staff is looking forward to your time at camp. There are a few spots still open for campers (coed is the only session with a waiting list). If you have a friend or relative that may be interested, SPREAD THE WORD! Wishing you a terrific April!! The update on Asto Wamah and what is happening on Columbia Lake is a COLD story. It seems as though the month of February brought colder, icier and windier weather than usual. Several of the ‘snow’ events turned to thick ice making the Camp Road treacherous and walking the paths a challenge. Luckily the wind did not take trees, just random branches. For a while Columbia Lake froze over and gave the ice-fishermen some opportunities to sit and fish. The lake presently has a number of areas that still have large floating ice areas that move with the wind. Fortunately the water is nowhere near our docks which stand to be ruined if hit by moving ice. February was, as usual, a very busy month for Asto Wamah. Enrollment opened on the first and by the end of the month there are a few openings remaining (except for coed-girls). We are starting a week earlier this summer to better accommodate snow days. That mean we end go a week later into August. At this time there are a few openings in each session so pass the word to friends, schoolmates and neighbors. Invite them to check out the videos that are on the website to get a better idea of what Asto Wamah looks like. On one video there are drone views of the A-Field that give you an idea of the improvements that have been made there. Can you see the huge rocks down by the basketball court? Those were pulled from the field during the grading stage. They were moved with the idea of making seating for Newcomb viewers! We are happy to see that so many of last summer’s campers are returning along with returnees from the 2018 staff. Plans for the 110th season at Asto Wamah are moving along with more of the ‘to be expected’ and some exciting new activities and initiatives. We very much look forward to seeing you this summer! We hope you have each enjoyed a wonderful holiday/ school vacation! The Asto Wamah Blog this month will contain lots of important information. This month begins in earnest the start-up of the 2019th season at camp. To start the month off, we will be holding our annual Camp Reunion on January 5th. The reunion will run from 2 to 4 PM at Center Church House, 60 Gold Street, Hartford, CT. The Church House is located between Bushnell Park (the one with the carousel) and Wadsworth Atheneum. Because parking is difficult in this part of town, you may be interested in the following directions. Parents can let their camper(s) off on Gold Street and camp staff (Drew and Nancy) will be outside to make sure all children arrive safely. If you know where Lewis Street intersects with Gold you can take advantage of the ‘pull off’ at the end of Lewis which is just feet from the door at 60 Gold. We will handle pick-up with the same level of supervision. The Camp Reunion is lots of fun!! We have slides from the past summer to watch and lots of games to play. It is an awesome time to reconnect with your camp friends and reminisce about warmer days. Ice cream will be our treat. We hope you will be able to attend. It won’t be the same without you! Within a few days, you will be receiving, via USPS, our 2019 giant postcard with information about the dates and fees for this summer. The purpose of this mailing is to remind you that registration will open on February 1. Registration is online and done on a first-come-first-served basis. Last year a good number of people ended up on a waiting list. Don’t let that happen to you!! To register, login to or create a new account using the UltraCamp link. As we enter 2019 our hope is that good health, happiness and remembering the other fellow will fill your community and with your help will spread! Welcome to the December 1st Blog. This has been a quiet fall at Asto Wamah. Many days were either too cold or too wet for outside work. Nevertheless we did manage to rake (carefully) the leaves off the new green grass on the A –Field. The grass continues to thicken each day. Our hope is for a sturdy green playing field by the time camp starts in June. If you have not already checked out the latest video, take a look at the drone footage, on our Home Page, taken in late in October. The leaves were still on the trees but the lake had been drained to its winter level. 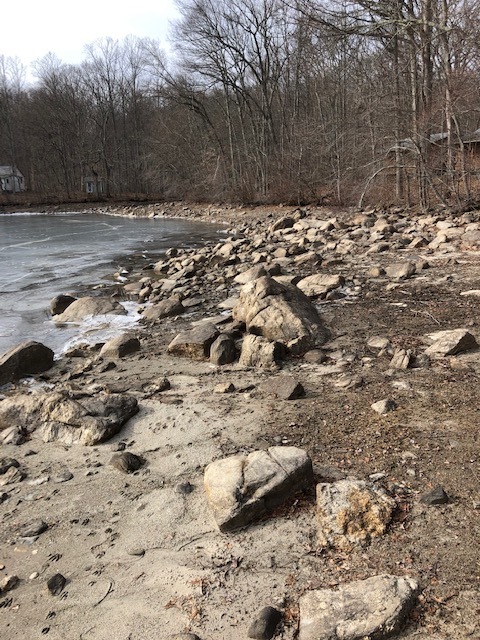 You can clearly see the shoreline rocks that escape our view in the summer. Shortly you will receive an invitation via email inviting you to the Camp Reunion. It will take place on Saturday January 5that the Church House, 60 Gold Street in Hartford from 2:00 to 4:00. The Church House is located between the Wadsworth Atheneum and Bushnell Park (with the carousel). We will watch 2018 slides, reconnect with camp friends, enjoy ice cream and play Minute-to-Win-It games. Please join us!! The invitation will outline the RSVP procedure. Our fingers are crossed for good weather: NO snow, ice or extreme temperature!! Early in January our “2019 postcard brochure” will be sent to you with a reminder that registration opens on February 1st. Last year a good number of people found that the sessions filled quickly and the only places left were on the waiting list. Register as soon as possible. We would also suggest that you send the names and addresses of interested friends so that they will get the pertinent notifications in a timely manner. We are hopeful that your month of December will be filled with wonderful events. Wishing you and your family a joyful Holiday Season and a Happy and Healthy New Year! This is the perfect time of the year to Remember the Other Fellow. Welcome to November and Eastern Standard Time. We trust you are happily embracing the arrival of cold and snowy weather. At this point it seems that those bone-burning days of summer are a distant memory. Today the camp road is covered with a blanket of leaves, the lake has been drawn down to its winter level and the woods are thinner, more open. As was noted in the last blog, the A-Field has been leveled, graded, de-rocked and seeded. We are now seeing a lot of green on this new flat playing field. The picture does not do credit to the wonderful improvement. It doesn’t look like the same place. You will be amazed when you see it! We are well into the planning stage for the 2019 CAW season. The biggest hurdle has been to decide on: THE START DATE. You may remember that last summer many schools were not out until quite late in June. That meant some of our ‘teaching’ staff did not finish until after staff training was over. With that memory clear in our minds, it has been decided that coed will begin a week later that usual. So coed will go from June 30 to July 6. The boys’ session will go from July 7 to 20. First girls will go from July 21 to August 3 and second girls will finish the season from August 4 to August 17. A postcard will be sent to you shortly with all this information. For the past 2 years Mother Nature have kept us from having our traditional Camp Reunion. We will try again on Jan 5, 2019. Save the date and we will be sending you more details via email very soon. We are keeping our fingers crossed for good weather so that you can all come and enjoy an afternoon of games, fun and reconnecting with camp friends. As in the past, we ask that you help us spread the word about Asto Wamah! YOU are our sole means of advertising. Introduce your friends, neighbors, relatives, and everyone you know to the Asto Wamah experience. Direct anyone who is interested to visit our website: www.campastowamah.org and set-up an account with Ultra Camp. That will allow them to access the latest news and information about camp and be prepared when enrollment opens on Feb. 1. If anyone would like to ask questions or learn more they can call Nancy, evenings, at 860-649-8614. Enjoy November!! It is the month of Thankfulness! Show Gratitude! We are now officially in the fall season with Halloween right around the corner. Hope all is going well for you! Life at Asto Wamah at this time of year is usually very quiet; however, this year has been a bit different. As you may remember, the basketball court was resurfaced in June to replace the old, broken up one. Well, now the entire A-field has been dug up! There will be no more holes, rocks, or bumps. The field has been graded so that it is now smooth and flat. Grass seeds have been planted and by mid-June, the A-field will be green and lush. The logs have been raised so seating is more comfortable and not so close to the dirt. Both the running long jump and standing jump areas are now clearly defined with wooden frames and will provide us with more of a “regulation” area for our Track Meet during two-week sessions. We will post pictures in the next Blog. We use the A-Field so many hours each day and for many different activities. We look forward to this improvement and think you will enjoy it! Between Hurricane Florence and last Tuesday’s 8 inches of rain, Columbia Lake is overflowing. The dam is now open to allow the excess water to run off. At this point, it appears that there will be no worry that the lake will be low next summer. In October, information about the dates and fees for the 2019 season will be announced. STAY TUNED! Hope your memories of the past summer are still vivid and make you smile! Day 13 - Last Day & Campfire!!! Today was a hot and hectic day for sure! As it was the last full day of the 2018 camp season, there was much to be done before we all leave tomorrow. Boats needed to be cleaned and tucked away, sports sheds tidied and packed, and everyone had to collect their arts & crafts projects. Swimming got one last day to enjoy the lake, as well as a few of the boaters! Dinner today was Texas Hash, a huge favorite that a lot of campers were especially excited for. Then came an extra special treat, double candy at store! After everyone had picked out their candy, it was off to our final rest hour. Following general swim and fourth period, we all played non-stop cricket, as a final camp-wide game. After an intense battle between the green and white teams from track and field day, everyone was rewarded with an ice pop to cool off. Cookee bell rang and we all got ready for supper, meatball grinders! Now, cabins are taking the last towel or two off the clothes line, packing up their trunks and getting ready for camp fire! Every session, on the final night, we head to the counsel ring for songs, s'mores and awards from swimming and boating classes. As well as track and field day ribbons, and the coveted cabin clean up award! Whichever cabin, within the three sections, passed Sue's inspection day in and day out, will be awarded a special prize tonight! The last Thursday of the session is a very important one here at Camp Asto Wamah, it's banquet night! The schedule runs as normal, just with an emphasis on trying to get a shower in today, as everyone attempts to look their best for this evenings Thanksgiving-style supper. Turkey, stuffing, gravy - you name it, it's on tonights menu! Campers got dressed in their cleanest, green and white outfits, and we all piled into the main room in the upper lodge to eat together. After enjoying ice cream, chocolate caramel crunch or cookie dough, it was time for the much anticipated slide show. Pictures from track and field day, general swim, and other various activities at camp made an appearance. As well as old throw back pictures of staff, LT's and campers! Charlotte and Gina lead us in songs that we hadn't gotten the chance to sing all session, as well as a few fan favorites. Then came time for year awards. First years get a green hat, so make sure to ask your new campers to try them on for you when they get home! Candle light is how we wrap up banquet, with each cabin counselor choosing one camper to read a short passage. During this, everyone gets an individual candle, which gets lit and placed into the lake. At the end, after everyone at camp has placed their candle into the lake, we sing good night songs and watch as the candles float away. Now, campers are off to get ready for bed, silently, as there is no more talking tonight. Giving time for campers to reflect on this session overall. Until tomorrow, for camp fire and the final full day at Wamah! Day 11 - Talent Night! This morning was a rare morning at Camp Asto Wamah, we slept in for a WHOLE HOUR!!! Some campers were thrilled, others chose to use it as a time to read or write letters, and the counselors for sure used it as time for more sleep! Cabin clean up time was cut a little short because of it, but the campers still managed to have the cabins looking fabulous before first period rang. Classes went on as normal, with an even greater focus on learning new skills as this session is nearly over! Sailers, swimmers, and boaters all enjoyed the water today, as well as the hot sun. Dinner, our noon time meal ended with a perfect treat for this hot and sunny day, ice cream! Then campers were off to rest hour before cooling down in general swim. Tonights evening program has been in the works for a few days, talent night! There were skits, comedy acts, singers/dancers and even a few magicians. Many of the cabins even chose to come together and create a group skit, which was awesome to see. After enjoying grapes for snack, its off to read more of the cabins book and get ready for bed! Today was hot, hot, hot! Luckily that meant everyone was eager to get in the water and have swimming lessons, after making sure to clean their cabins this morning. Campers were very focused this morning and the first three classes ran smoothly. Swimmer learned new strokes, lots of butterfly bootcamps, and boaters worked on their own skills too! Some even learned how to capsize safely. Arts and crafts is a perfect time to work on secret sister projects, our secret santa spin at camp, which will be revealed tomorrow! For dinner we had pork shops and butterscotch pudding! Rest hour was a perfect time to attempt to cool off in the cabins, with the fans on of course. Then everyone went in for general swim before finishing up the day with fourth period and activity period. Sunfishes (our smaller sail boats), paddle boards, and snorkelers all enjoyed the water during activity period today! Then it was off to dry off and change for supper - grilled cheese! Tonights evening program is extra special, it is completely run by the LT's! Every year LT's pick a theme and plan all session for one night, where they create various games and activities or all campers to participate in. LT Carnival is certainly a night to remember, and this year I'm sure it will be OUT OF THIS WORLD!!!!! You'll have to ask your campers about it when they get back! Today was our yearly all-day event.... Track Meet! Today is a different schedule then normal, and campers are split into Green and White teams, and compete in events like Standing Jump, Long Jump, Softball Throw, a 50 Yard Dash, a "Marathon", and Swim Races. Luckily, Track Meet usually entails a morning General Swim, and we sure needed it today, because it was hot! Some of the events take place after lunch, including the Wamah Triathlon. This event involves every camper, and most staff, and takes participants from the very top of the camp road, onto the lake, back onto land at Hungerford, and a grand finale finish in the water. Some people run, some people swim, some people are in boats and canoes- and everyone gets to watch the final leg, of a longer distance swim. Special thanks to Drew who orchestrates the whole thing, because its an important tradiaional event here at Asto Wamah. We had our usual ham and noodles for lunch, and dinner was "pick-up"- the all camp version of leftover night at home. It is one of my favorites, because you get to eat a variety of items all at once! We of course had green and white cake to finish off supper. Campers are off to bed now, and just finished some team relay games, which are always fun. These included Dizzy Lizzy, a soccer ball dribble, a Relay Race, and more. It's a fun, silly way to end the day. We were so lucky with today's weather, and as we look into the forecast and hear about the heat that is to come, we always try to remember how lucky we are here at Asto Wamah to have beautiful Columbia Lake to go in! Day 7- A rainy start, but a beautiful end! Today started out rainy, with indoor games instead of regular activities. Sports class played a hilarious game that involved acting, guessing, and most of all... laughing! Swim classes played Scattergories and Charades, and Boating classes played Smallcraft Jeopardy. Before we had a slightly longer Rest Hour, we all had the fan-favorite lasagna! It was the perfect day for it, with the drizzle and clouds. The afternoon brought a Sing-off, but by 4th period the sun was out, so boats were able to go out! Activity Period was full of fishermen, girls jumping off the tower, ukulele playing, as well as plenty of boating practice. This evening was Eat Out, with hot dogs, potato chips, and the fixings, and we were lucky enough to be able to eat outside! Evening Program was my own personal favorite game ever.... King Dodge (although some of the girls requested that we call it the appropriate Queen Dodge instead!) Tomorrow is our traditional Track Meet, so we hope that everyone gets a lot of rest! The fifth day of camp began with chocolate chip bread, much to the campers delight. We were able to avoid the rain until much later in the day, and so morning classes went off without a hitch. For dinner we had chicken parmesan and sorbet (both strawberry and lemon). After a nice and relaxing rest hour, it was time for general swim! Campers paired up, and went into their respective swimming levels before fourth period and activity period. Supper this evening was pulled pork and cherry cake. Due to a quick, but heavy rain storm, evening program was inside. It was Deck-A-Counselor! Each cabin picked 2 staff members, and a few LT's, and created skits with them - all while dressing them up however they decided! It was a very entertaining night to say the least! Today camp began with waffles and peanut butter, a fan favorite. Our morning ran as normal, as we luckily avoided the threat of rain once again! Dinner was meatloaf, a new recipe this camp season, and the campers really liked it. Butterscotch pudding followed, before it was time for rest hour. Then the day really got interesting! A special African Drumming program visited camp today, and each group of campers got to participate with their cabins. While very loud, it was very exciting and the campers really enjoyed it. With a funky schedule to fit everyones classes in, as well as this program, it took us right up to supper. Tonight we had chicken melts and gingerbread cake. Now all the campers are getting ready for evening program, in long pants, tied shoes, and dark clothing. Any guesses???? PIRATES! Our fourth day here at camp kicked off with chocolate chip bread and cereal! Then came time for cabin pictures! Chris got all the cabins taken care of quickly, so that they could go back and clean the cabins, in hopes of impressing Sue - the nurse! Everyday Sue inspects each cabin to find the cleanest within the three groups (hilltop, lakeside and seniors) to find a winner of Cabin Clean Up. The rain held off and we were able to get all classes in this morning. Sailors enjoyed a perfectly windy day on the lake and each class went out! For dinner, we had ziti and salad, with vanilla pudding for dessert. Following rest hour, we practiced a fire drill incase of emergencies, and then a quick passing of rain prevented us from getting to go into the water for general swim. Luckily, fourth period was able to go on as normal (minus sports in the upper lodge). Activity period was filled with tons options from LT's and counselors! A few LT's lead a dance party in our activity room and had an awesome turn out! Brendan and Sloane even took out a group of girls in the Hunter, our largest sail boat! They all had a blast! Supper tonight, was eat out! This meant counselors packed up picnic baskets, filled with sandwiches and bug juice (camp slang for lemonade), and set off for different places around camp! From docks and picnic tables, to the lean-to and counsel ring, cabins were spread out all over! Afterwards, we headed back to our cabins and put on tied shoes and long pants, because tonights evening program was Capture the Flag! Everyone got really into it tonight, and now they're changing into their bathing suits for a quick dip before heading to bed! Last first day of the 2018 camp season! Second girls kicked off on this beautiful and sunny day, making drop off a breeze. With seventeen LT's (leadership trainees) to help carry trunks and show campers to their cabins, it was made even easier! After everyone was all moved in, introductions and rules given out, it was time for a quick general swim! Everyone got into the water to cool off just before supper, our evening meal! Supper tonight, per camp tradition, was hot dogs and brownies for dessert! Evening program, another first-night tradtion of 'Medical Wars' got the whole camp involved! Every night we, as a whole camp, come together to play one big game! After a few intense rounds, quick dip was offered before campers got ready for bed. Then counselors read the camper-choosen book to help with falling asleep. They will read this book for the rest of the session as a great way to wrap up the day! Now it's time for everyone to get some sleep in preparation with our first full day of classes and activities! To start off our final full day for this session, we had English muffins for breakfast with cereal alternatives. We were fortunate enough to have a sunny and clear-skied day for final testing in all classes. Campers put in their best efforts to pass their swimming and small craft classes, and finished up arts and crafts projects. The great weather continued and we had a great general swim after rest hour. A little later in the afternoon, a group of campers took to the lake in all seven of the Sunfish sailboats and our big Hunter sailboat to play a game of pirates! It was a lot of fun and everyone had a great time. Currently campers are headed to the council ring for our campfire where they will receive rewards if they passed their small craft and swimming classes. Awards will also be given to those who placed in Track and Field events, and to those who maintained the cleanest cabin throughout the session. What everyone is most excited for however are the s'mores! Looking forward to seeing everyone tomorrow for pickup in the morning from 8:30-10am! Yesterday we had a great day and despite thinking the weather would make things challenging we lucked out for the most part! Sailboats and other small crafts were able to go out and practice on the lake, and campers had a great time in swimming class as well. We had a quick storm that came by in the afternoon but we had clear skies after for banquet! The second Thursday is a special day with banquet, as the whole camp gets together and has supper in the main room of the upper lodge. After a great meal consisting of turkey, stuffing, mashed potatoes and more, we sung songs and watched a great slide show of pictures taken from throughout the session which everyone loved. Banquet closes with a candlelight service, where each camper gets a candle in a bowl. Most of the time we gather in a circle around the flagpole and light each candle one by one, but because there was minimal wind on the lake, we were able to float the candles onto the lake and enjoy the beautiful sight of watching all the candles slowly float away. It truly is a special sight to see and everyone enjoyed it. We have great weather for our last full day of camp which everyone is excited and thankful for.